Last year we launched the series “Be a Tourist in Your Own Community” highlighting tips and suggestions about experiencing unique events and attractions in your own backyard. As locals, we all know where the iconic nightlife plays out in Stillwater America. The Strip, just south of Oklahoma State University, has long been the reigning champ for college town nightlife and is still home to our most legendary after-hours hotspots. However, allow us to make a handful of recommendations you may have not considered. Stay in Stillwater for your next evening out with pals over cocktails, live music, or cold brews. Here are a few of our local favorites. Who painted the Sistine chapel? What movie did Elvis Presley make his first onscreen appearance? Which team won the 2015 Super Bowl? If you can answer these questions, or your friends tout you as a know-it-all, we suggest a night of trivia at The Garage on Tuesdays or Iron Monk Brewing Co. on Wednesdays. Take your pick or hit both and win not only great prizes, but the admiration of your peers for all those useless facts you&apos;ve stored away just for this moment. Mojo’s Rock ‘n’ Bowl Grill and The Garage have the perfect after-five date night – BINGO! Bingo happens every week on Wednesdays and Thursdays. Blot your cards, order the monthly cocktail special and turn up your outside voice to belt BINGO this month. Round up friends and make trivia and bingo a part of your mid-week lineup. 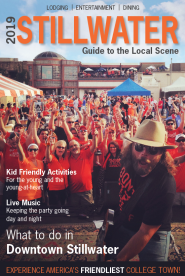 Known as the Home of Red Dirt Music, Stillwater’s music scene continues strong. In September, you&apos;ll find a wide variety of live music happening just in time for happy hour or after-hours. If you haven’t heard them play, you don’t know what you’re missing – MORGAN, named after lead vocalist Morgan Reynolds, incorporates numerous genres and instruments into every show to which no two shows are alike. They have quickly become a favorite Stillwater staple playing in a variety of Stillwater venues. We recommend catching them at Iron Monk Brewery Co. on September 21st. Want a side of outdoor ambiance with your live music? The Botanic Garden at OSU is featuring Miss Blues, Dorothy Ellis, at their Concert in the Garden on September 8th. Miss Blues is the real deal - having lived the blues, she draws inspiration everywhere from her simple Texas roots to earning her Master’s degree. She received a “Woody” award in 2007 from the Oklahoma Gazette which called her “the state’s first lady of the blues.” If you are a blues lover, you don’t want to miss her smoky harmonies, sizzling lyrics, and her fiery “shout style” vocals. Influenced by artists such as Waylon Jennings, Johnny Cash, and Lynyrd Skynyrd, Whiskey Myers comes from Texas but their Red Dirt roots run deep. Playing at Tumbleweed Dance Hall on September 22nd, this five-man group is made up of friends and family and their close ties are reflected in their chemistry on stage. Whiskey Myers states they “make honest music” and honestly, we think you won’t want to miss this show. With local favorites such as The Copper Penny, The College Bar, and Outlaws, a night on the Strip means good times with friends, a limey (or two! ), and maybe even a footlong chili cheese dog from The Strip’s iconic Coney Island. One of the most historic bars on the Strip, Willie’s Saloon, is home to the very stage where Garth Brooks performed his first public concert. Today, you can find a wide variety of live music including Stillwater staples such as Mike Hosty, Sweeper, and Tres Dudes. If you are familiar with The State Room, inside The Atherton Hotel at OSU, you probably have tried one of their enchanting cocktails, if you aren’t familiar – you need to become acquainted. Not just for overnight guests, the State Room is available for locals and visitors alike. Stop in and experience the luxurious surroundings and ask the bartender to help you pick out the perfect cocktail. We suggest the Fitzgerald or Water Lily! Stillwater’s downtown scene has much to offer by way of after-five fun, starting with the only Irish pub in town - Finnegan’s Fighting Goat. Finnegan’s offers 36 beers on tap and more than 50 bottled beers, free pool tables, shuffle board, and is THE place to be on St. Patrick’s Day. If you&apos;re looking to bring Fido for a night on the town – pets are welcome! One of our favorite evening hotspots with a plethora of variety is Zannotti’s Wine Bar on 7th Avenue. From their flatbread pizzas and delectable desserts to their mile-long wine, whiskey and scotch lists, Zannotti&apos;s Wine Bar offers a fresh and vibrant menu for a classy-casual evening out with co-workers or old friends.